The other day, we ran to Kobe port terminal since we got an information that the largest floating hotel ever in Kobe entered port of Kobe. We were overwhelmed by its existence and largeness. There are shopping mall, concert hall which 1500 persons can sits and skate link are in the ship. My brain is poor and it was convincing these kind of floating hotels are only available when the passenger can afford to go on a world cruise, but actually, we can be a passenger of it if you can afford to go on a few days of cruise which doesn’t cost much. So there’d be a chance in near future for us and wish we can introduce the inside of it on this blog. 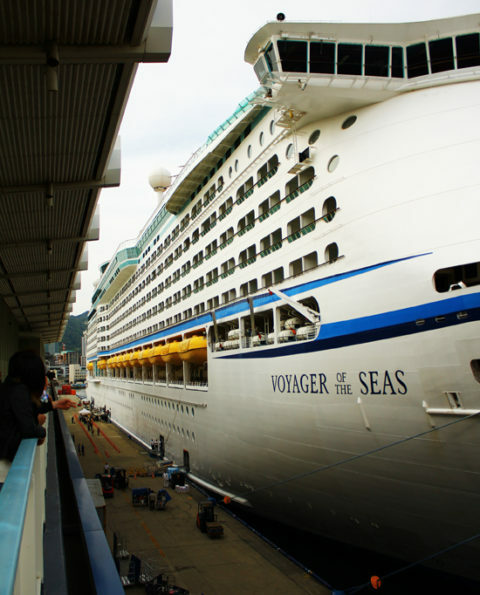 Photo: Voyager of the Seas in Kobe port terminal.